The amount is very small, but this shows the global impact of the Fukushima disaster. Check out these shocking photos of Fukushima mutants. 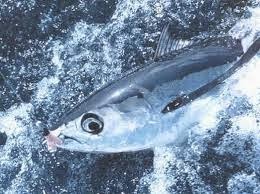 PORTLAND Ore. (Reuters) - A sample of albacore tuna caught off the shores of Oregon and Washington state have small levels of radioactivity from the 2011 Fukushima nuclear disaster in Japan, researchers said on Tuesday. But authors of the Oregon State University study say the levels are so small you would have to consume more than 700,000 pounds of the fish with the highest radioactive level to match the amount of radiation the average person is annually exposed to in everyday life through cosmic rays, the air, the ground, X-rays and other sources. Still, the findings shed some light about the impact of the meltdown on the Pacific Ocean following the March 2011 tsunami and subsequent power plant disaster, said Delvan Neville, a graduate research assistant at OSU and lead author of the study. “I think people would rather have an answer on what is there and what isn’t there than have a big question mark,” Neville said. At the most extreme, radiation levels tripled from fish tested before Fuskushima and fish tested after. That level was 0.1 percent of the level set by the U.S. Food and Drug Administration for concern.